Olympics boss Jacques Rogge has told Usain Bolt to show more respect for opponents after the Jamaican claimed the first sprint double for 24 years. Bolt showboated at the start and finish of his world-record breaking 200m race and slowed up yards from the line in the 100m final so he could celebrate. “That’s not the way we perceive being a champion,” Rogge told Associated Press. The other runners in Wednesday’s 200m did not seem upset with Bolt’s antics – American silver medallist Shawn Crawford telling reporters afterwards: “I love watching him when he does his thing. Bolt told reporters he had “no regrets” about his showy 100m finish, or his antics after setting a new world best of 19.30 secs in winning the 200m. Rogge’s comments did seem out of kilter with the mood in the Bird’s Nest stadium, where the crowd appeared to lap up his childlike joy at becoming the first man since American Carl Lewis in 1984 to win an Olympic double in the 100m and 200m. Bolt won by the biggest margin since the 200m came on the Olympic scene 108 years ago, beating the field by two-thirds of a second to break Michael Johnson’s 12-year-old record by two hundredths of a second. And others will also argue Bolt is simply continuing an Olympic sprinting tradition of colourful, showy champions such as Carl Lewis, Maurice Greene and Johnson, who called Bolt “Superman 2”. BBC Sport’s Steve Cram said: “There was nothing wrong with it (the celebration). “If Bolt was being disrepectful, then fine, but he’s just done something that no other sprinter has done before. “He is very good for the sport, he’s a young man, it’s his birthday and he’s just become a legend in the sport. “Lightning” Bolt, as he says he prefers to be known, had brought the 91,000-seater stadium to its feet, running a record first 100m and then chasing down Johnson’s mark over the final 50m, his eyes flicking left all the time as he checked the trackside clock. When he dipped his lanky 6ft 5in frame for the line, the crowd erupted and Bolt embarked on a triumphant victory lap to the sound of reggae music, dancing a barefoot jig around his golden spikes while draped in Jamaican flags. “It’s just a dance from back home,” he said in explanation of one knock-kneed display. There was even a special rendition of ‘Happy Birthday Dear Usain’ played over the public address system – he is 22 on Thursday. “I’m number one,” the joyous athlete mouthed at cameras, thumping his chest and blowing kisses. 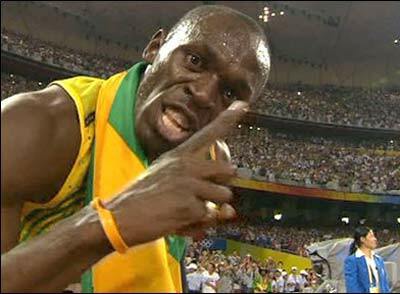 In his post-race interview, Bolt admitted he could barely believe his achievement. “Everything just came together,” he said in amazement. “I blew my mind, I blew the world’s mind. “I was looking at the replay and thinking, ‘Hey – I look cool!’ I was thinking, ‘Wow that guy looks fast!’ It’s just a great feeling. And he was reluctant to play the “I am the greatest” card. But in Jamaica, Bolt’s exploits have brought the island nation to a standstill and a huge victory parade is planned for the return of the successful Olympic team. Jamaican Prime Minister Bruce Golding phoned Bolt as he left the track, telling him his exploits had sent the country into raptures. “Usain Bolt is a super human being. The world has never seen anything like him,” said Golding. Bolt family friend and member of the local municipal council, Phillip Service, told Reuters news agency that Falmouth town square was blocked by convoys of cars celebrating. “Some persons have placed desks in the road and placed a vast amount of liquor on them for everyone to drink and be merry. It is just like carnival down here,” Service said. Bolt’s second gold took Jamaica – population 2.7m – briefly to the top of the athletics medal table and they now sit second behind Russia – population 142m million – but ahead of the US – population 305m. “Jamaica is the sprint factory of the world,” said Sports Minister Olivia Grange. And Jamaicans will have hopes of finishing top with more chances in Thursday’s 200m women’s final and the four relays on Friday night. Bolt, meanwhile, said he was going to spend his 22nd birthday sleeping and “letting it all soak in”. Rogge did concede that Bolt’s double now put him on a par with other previous Olympic greats. “Bolt is in another dimension in sprints,” said Rogge. “Bolt must be considered now the same way like Jesse Owens should have been in the 1930s. Bolt has a bigger edge than Owens on his rivals.